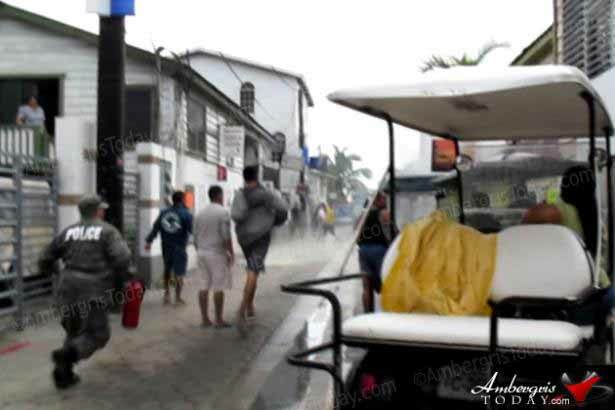 Faulty electrical wiring was the cause of a small explosion outside a local residence/business complex on Pescador Drive (Middle Street) this morning, Wednesday, October 29, 2014, that would have caused a major fire in downtown San Pedro, Ambergris Caye, if it were not the quick thinking of alert and caring neighbors. The San Pedro Fire Department and the Belize Electricity Limited (BEL) were immediately informed of the situation as the electrical meter had exploded on the resident building that housed the two local businesses, Sundancer Realty and Island Bargain Center across from Nellie’s Property Management/Laundromat. Minutes later, the meter wiring started sparking once again and a section of the wooden wall started to catch on fire.